CSE’s Housing Assessment Model (HAM) is a tool that models the energy performance and energy efficiency (SAP rating) of dwellings at address level. As part of CSE’s work on the Green Deal Incubator – our project funded by Scottish and Southern Energy and the Sainsbury Family Charitable Trust exploring how Green Deal could work for local communities and businesses – CSE has used HAM to model housing data for the whole South West region. The results provide a high level estimate of the potential for attracting Green Deal finance and ECO funding into different local authority areas and the region as a whole. The spreadsheet showing the summary results for the South West can be downloaded here. The data has been compiled using Experian variables, a classification analysis to predict further variables and assumptions from the ‘Reduced SAP’ assessment (RD SAP). The model determines all possible improvement measures applicable to each house that will increase energy efficiency and reduce energy bills and carbon emissions. The financial implications of each package of measures, including Green Deal and ECO finance (Carbon Reduction and Affordable Warmth) options are also calculated. In addition, for Green Deal households the model calculates the annual and total loan repayments. Financial details for Affordable Warmth customers in the region. The results suggest there is huge theoretical potential the South West to attract Green Deal and ECO finance – more than £22 billion if every single eligible household signed up – with a corresponding total potential fuel bill saving of almost £2 billion. Of course, real levels of savings are contingent on the extent to which eligible households are receptive to the new Green Deal and ECO schemes offered. 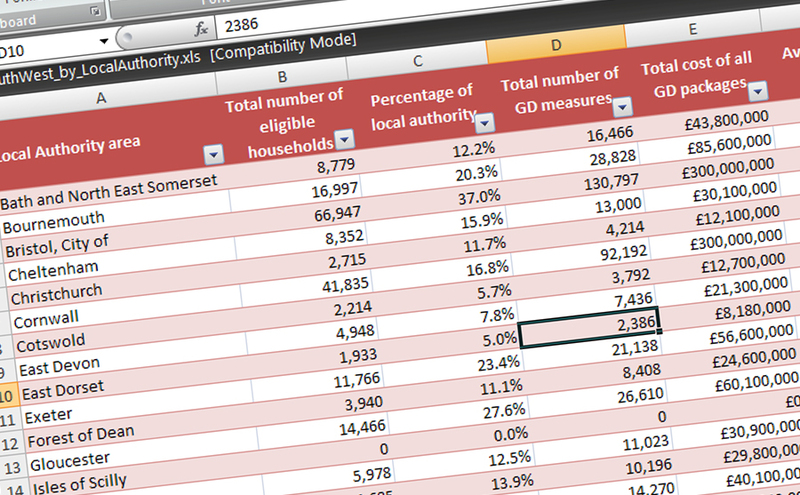 Using the Housing Assessment Model, CSE can provide more detailed analysis for local authorities, community groups and others to assess which households, streets and output areas stand to gain the most from the Green Deal and ECO policies. CSE has also used HAM to model housing providers’ own stock enabling them to strategically plan their investment in energy efficiency works, including time lines of what can be achieved by when and how the programmes will be financed. For an example of this, click here. Aspects of the HAM model can be adjusted to allow flexibility, sensitivity analysis and tailored assessment of different geographical areas, household types etc. For example, the selection criteria for each measure can be changed, measures added or removed, the Green Deal interest rates and loan repayment times changed, comfort and ‘in-use’ factors of measures altered and the thresholds for ECO Affordable warmth adjusted. Data and results can also be provided in a form that helps local authorities to meet their HECA (Home Energy Conservation Act) requirements to report on measures proposed to improve the energy efficiency of all the residential accommodation in their areas. In short, this could be your answer to HECA. For more information on the type of detailed analysis we could provide for your area, please contact Janine Michael on janine.michael@cse.org.uk or 0117 934 1414. Image Copyright Derek Harper. This work is licensed under the Creative Commons Attribution-Share Alike 2.0 Generic Licence.